Back in cold Germany. 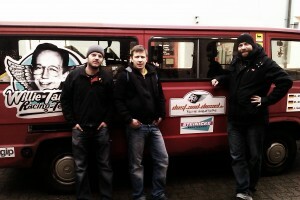 After 26 days, we landed safely in Frankfurt on January, 19th. Of course, people ask me: How was it? It’s hard for me to find a short answer to this question. However, I’ll try to sort my thoughts and draw a conclusion – let’s see, if I succeed. The rallye is officially over. We arrived at the Zebra bar in Senegal. The perfect place to relax after these exciting weeks. Everybody is fine and trys to deal with the impressions of the journey. Not so easy, as there are a lot. It will surely take some weeks to realize what we have done. Senegal is where black Africa begins and the oppressive feeling, which we encountered in Mauritania, flies away. The people seem to be happier, although they are not really better off. As the first participants prepare to leave, you realize that even though it was a group of more than 50 people, it’s hard to say goodbye after such an adventure. And it really was an adventure. 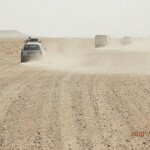 The desert, poverty, heat, dust and diesel. I am glad that I went on this journey. Now that I am back at home, I will dare to reflect. The desert is crossed. We’ve arrived in Nouakchott, the capital of Mauretania – the next to last leg before driving to Senegal tomorrow. The desert was phenomenal. On the one hand, the landscape is really awe-inspiring. Once we slept at a dune in the middle of nowhere and twice on the beach, I’ve never seen such a starry sky. On the other hand, this is a surreal situation driving cars through deep sand plains or across dunes, which the vehicles initially were never conceived for. Of course, the vehicles were raised and equipped with sensible underbody protection, yet they are still everyday cars or transporters, like our MB100. And just this car has done a sensational job. In contrast to others, we didn’t get stuck once and had no mechanical problems. 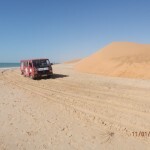 One vehicle suffered a broken axle in the sand and had to be left behind in the Sahara. We then carried the drivers‘ baggage and others took in the passengers. After the direct trek through the desert we drove on the shore. Over 100 km direct along the ocean, unparalleled! Unfortunately, we couldn’t pass through a narrow point –usually a short drive through the water to pass huge rocks – due to high tide. Without further ado, we opted for the route via a higher-lying dune and shoveled a ramp in order to reach the shore again below. Unforgettable scenes. Today we also visited the second of aepn’s orphan children’s projekts. The scenes were similar to the first home. There isn’t much of anything, but the best that can be done is being done and the children are well cared for! We’re now looking forward to Senegal and a few days of relaxation at the Zebrabar. I’ll certainly send some concluding thoughts from there. 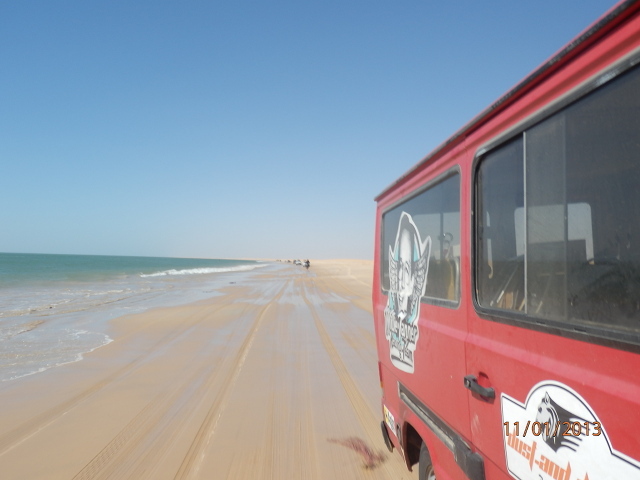 We’re having a day off in Dakhla – getting the cars fixed (the axle suspension of one of the cars broke – got fixed for 30 €) and relaxing. With 20°C at the beach, that’s easy. At the moment, we are in the Western Sahara, a politically disputed region, which Morocco claims for itself. 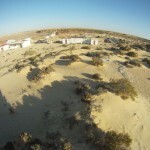 Morocco is attemting – without success – to fill this region with life by building ghost towns in the middle of nowhere. There are houses for over 50 families – but the only occupants are guards, who protect the area. Very bizarre. 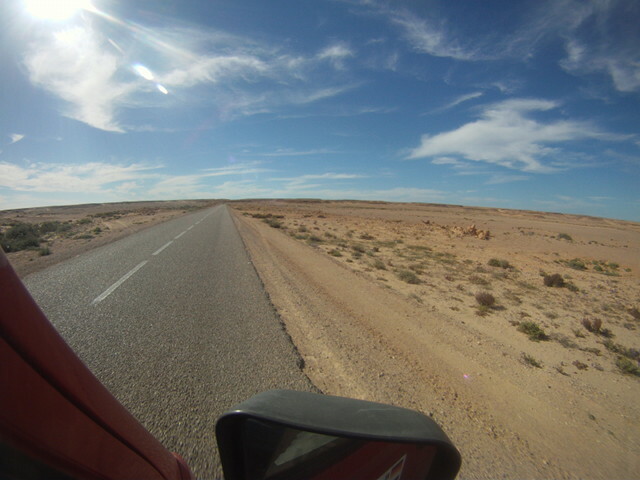 Our route took us from Guelmin to Laayoune and then ultimately to Dakhla. 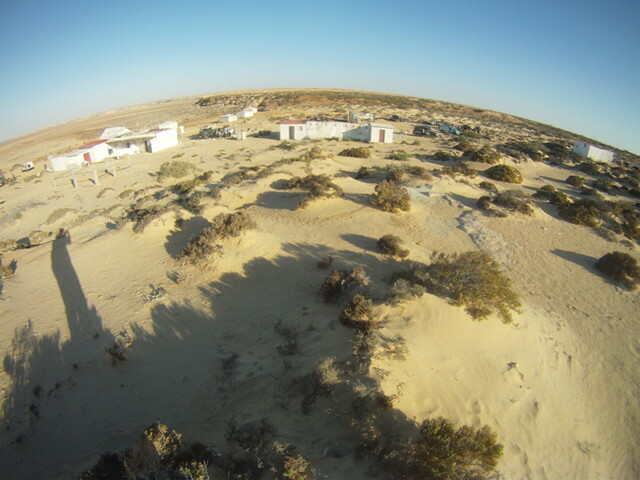 Not far from Laayoune, we stayed in a dune camp overnight, located along a tidal flat. Sand, all around sand. After that, the track was straight on. Sometimes you couldn’t see the end of the road, only a flicker at the horizon. Once our fuel got scarce and we needed to use one of our spare canisters. It’s very wise to use fuel canisters here, as one of the gas stations simply didn’t have enough fuel for all cars. 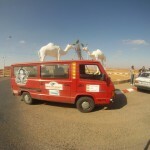 That is how it is in the Western Sahara. The situation is pretty relaxed in general, only interrupted by some police controls, which are friendly most of the time due to our „Rallye humanitaire“. Small presents shorten the waiting time. 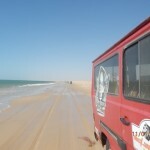 However, tomorrow we will have to wait a bit longer, as we’re going to Mauritania. You can spend several hours at the border. The route goes through a mine field. 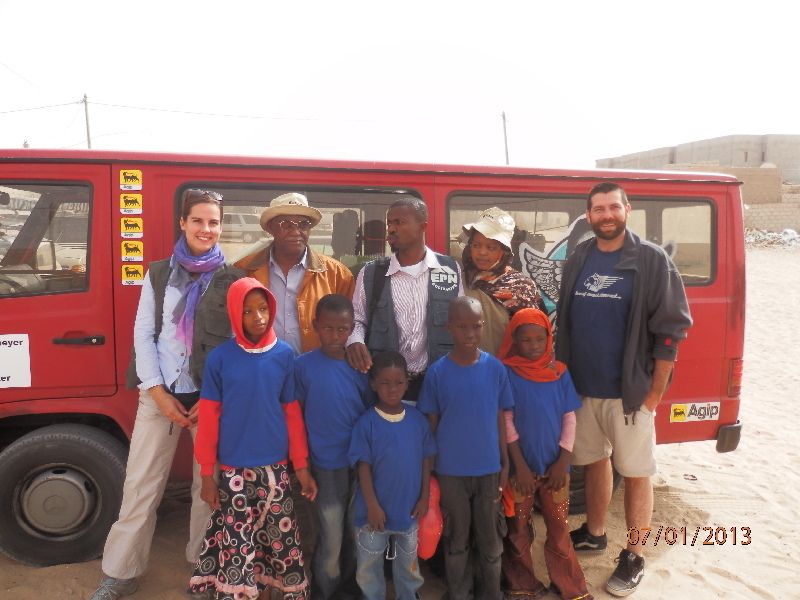 We’re looking forward to seeing the no man’s land as well as visiting the children of the aepn project in Nouadhibou, who we are to meet tomorrow. 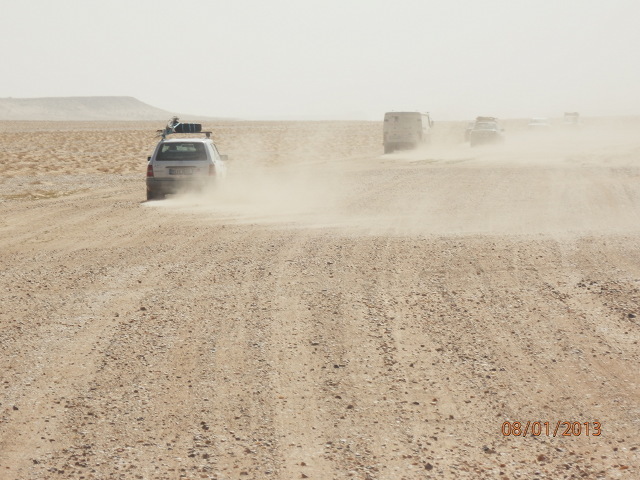 After that, we will drive into the desert in convoy with military protection. 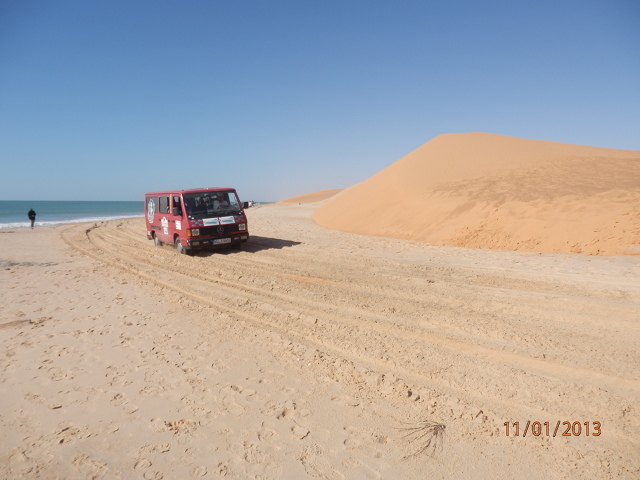 We’ll be driving on sand, through dunes and on the beach – let’s see, how our „red flash“ will handle it. We’re confident ‘though. In Mauritania, the connection may be bad. But I’ll try to send a sign of life from there, too. Marrakech was a dream, like of 1000 and one nights: a big hustle and bustle, an endlessly big crowd with snake charmers, juggler, music and a lot of food. 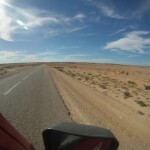 Drove through Agadir to Guelmin then. This is where the civilisation ends and the steppe begins. We’re just getting the car of one participant fixed, the shock absorbers are broken: We drove on the first track with slanting and a river crossing yesterday. Our bus does a good job. Slept on the estate of an former rallye driver yesterday, Fort bou jerif. 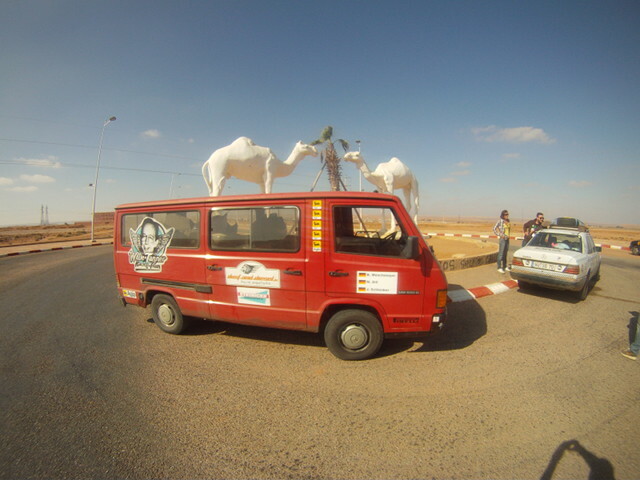 Today we have an hop of 200 km from Tantan in southern direction to the Sahara.